There are a number of variant spellings of the surname Rowden. Some may be considered closer variations than others. Nevertheless, the only true variant of ROWDEN is ROWDON, or vice versa. The families who bear these variations of the spellings will not be related to each other or to whose surname is ROWDEN. This is because each variant surname can be found in very tight geographical area of origin. Below is a map which depicts those areas in the UK where each surname variation is found. The source data is from the 1881 census, with analysis provided by the Great Britian Family Names Profiling website. Hold your mouse over one of the names below to view the areas in which the respective surname can be found in the year of 1881. 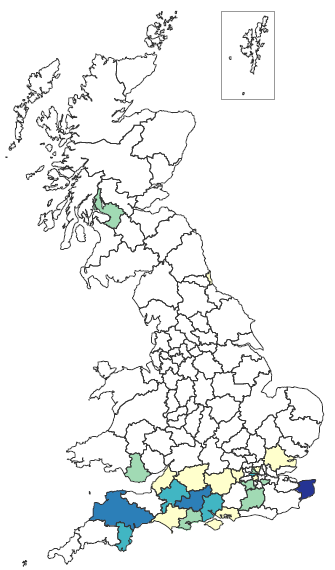 The surname ROWDEN has its origins in Devon, Wiltshire and Herefordshire. The concentration of the name in Kent is due to a Rowden family that originated in Wiltshire. The ROWDON surname originates almost exclusively in Devon. The surname RAWDEN has its origins in the region around The Wash, largley in Lincolnshire. The indication on the map of this surname existing in south Devon is erroneous and due to poor transcription of records. It is no surprise then that the surname RAWDON has geographic origins similar to those of Rawden but also includes a significant part of Yorkshire just north of the river Humber. The RODEN surname is found in an area north-west of Birmingham. It includes mainly the counties of Staffordshire and Shropshire and Warwickshire. There are a few existing Rowden named families who have been found to have changed their surname from one of these variant spellings. For unknown reasons the changes invariably happened at the start of the 20th century. See the variant family records page for more.